African Red Tea Face Cream is great for any type of skin, it contains large amounts of Alpha Hydroxy Acid and Zinc for a healthy, smooth skin. It is especially useful for itching, skin rashes and eczema. It penetrates and nourishes your skin like no other lotion can. It is excellent in helping wounds to heal, and helps to reduce inflammation caused by arthritic conditions.It is an excellent moisturizer for your face that is rich in antioxidants from the Rooibos Tea extract, and the DMAE. These antioxidants help combat and help neutralize harmful free-radicals, which affect the body in damaging our skin. These ingredients combined together are unsurpassed in protecting your face from anti-aging. It has been very beneficial in reducing wrinkles, liver spots, red skin (roseate) and dry rough skin. 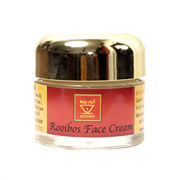 Rooibos Face Cream is shipped in a discrete, unmarked package. Orders are processed immediately and usually take about 3 to 5 working days to be received. We do ask that you try it for 2 to 3 weeks to feel the full effects. Any information received is used only for order processing and shipping purposes. Your information, such as e-mail address, will never be disclosed to a third party.